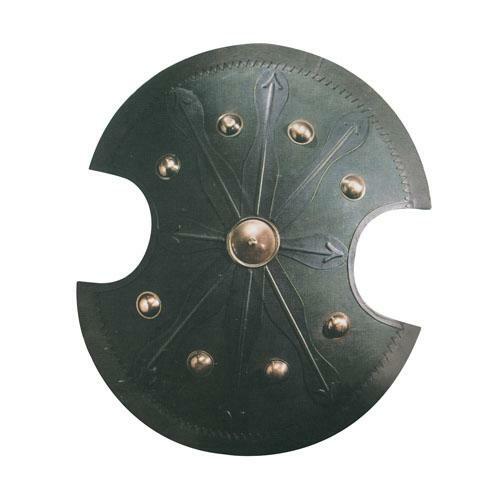 Greek shield used in the eighth century BC by the characteristic oval shape with lateral notches, known as "Dipylon" from the name of a cemetery in Athens which were found many representations of it. The "Dipylon" probably derives from a more ancient shield-shaped "8" in use during the Mycenaean age from the fifteenth century BC and which is the direct evolution. Remarkable reproduction wood covered with black leather, with boss and metal studs. Certified copy of a greek shield in original size. A similar shield was taken by Brad Pitt Achilles in the movie "Troy." Handmade wood and upholstered with leather and metal studs boss. It weighs about 5.5 kg. (12 lbs). Overall diameter: 112 cm. (44 inch).